One of my favourite smells in the kitchen, the one that brings feelings of comfort and nourishment, and a guarantee of food that can be shared, is a pot of chicken soup as it gently simmers on the stove top. 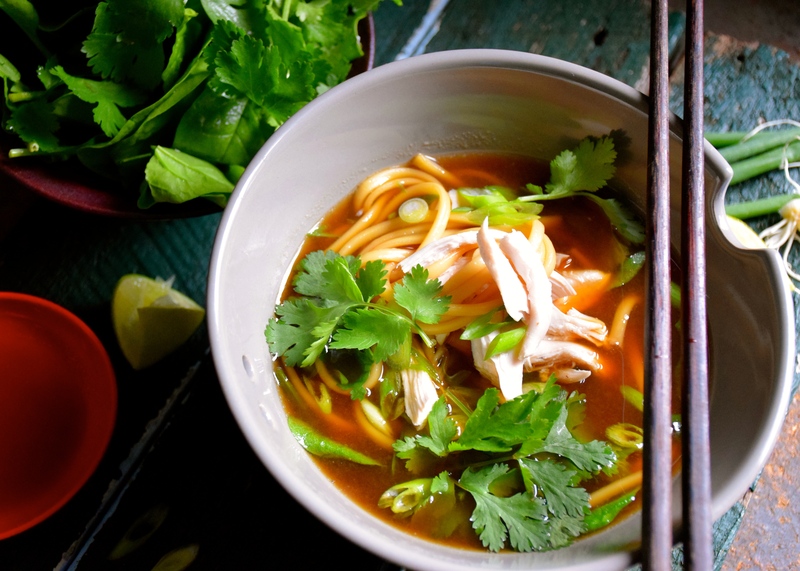 This chicken soup is one of a sweet nature. The combination of sweet and salty soy sauce flavours the broth and gives it its rich dark colouring. There is fresh ginger, kaffir lime, chilli and cardamon added, and by the time the broth is ready the flavours are complex and layered. If there is one piece of advice to follow, be it this: Start with a quality free-range chicken. This will give your broth the best flavour it deserves. That flavour leaches out into the broth permeating the stock with goodness and as well as the flesh of the chicken, once shredded being of a greater quality remaining soft and succulent. The remaining broth can be stored for several days. You heat it and cook more noodles as required. The broth also freezes well so portion it up and keep it frozen for those days you need nourishing and comforting. 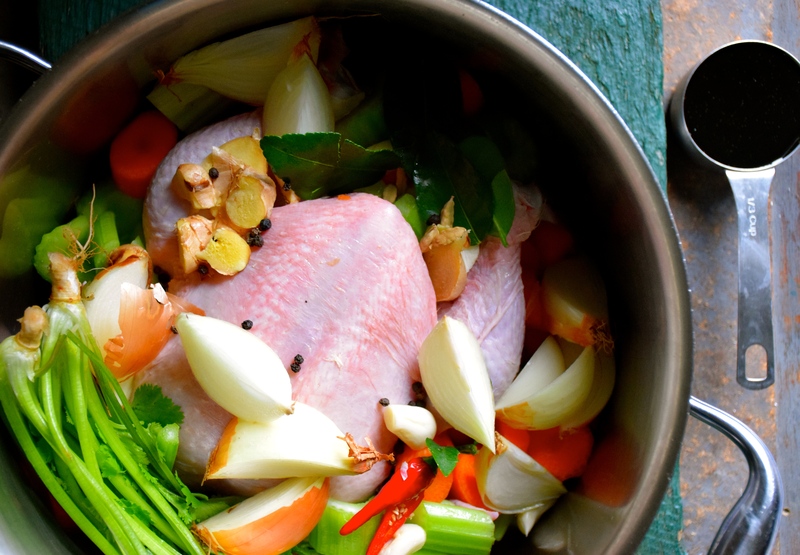 Place the chicken in a large pot, add the onions, carrot, celery, ginger, garlic, kaffir lime, chilli, coriander root, cardamon pods, black peppercorns and both the soy sauces. Add 3 litres of cold water, bring to the boil, turn down the heat, skim off any impurities that rise to the top and simmer gently for 45 minutes. Turn off the heat and stand chicken in the broth for another 15 minutes. Remove chicken and set aside on a tray. Once cool enough to handle, discard the skin and shred chicken into thin strips. Discard the bones, set chicken aside. Strain the broth into a medium sized pan, press the vegetables into the strainer to squeeze all the flavour from the cooked veg, discard the vegetables. Skim off any excess fat and taste for seasoning. Mix together a 50/50 ratio of Chinese red vinegar and hot chilli sauce. To serve, cook the udon noodles in plenty of boiling water to packet instructions, drain and divide noodles between bowls. Heat the amount of broth required, once it comes to the boil add some shredded chicken back into the broth and ladle over the hot noodles. 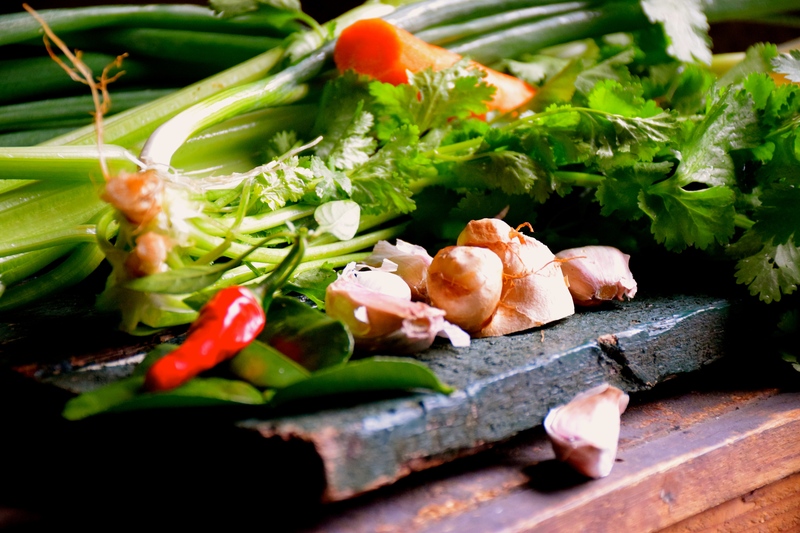 Garnish with spinach, coriander leaves and green onions. Spoon over some hot chilli and vinegar sauce, squeeze a wedge of fresh lime on top and eat immediately. What a gorgeous broth. Complex ingredients yet simple preparation. 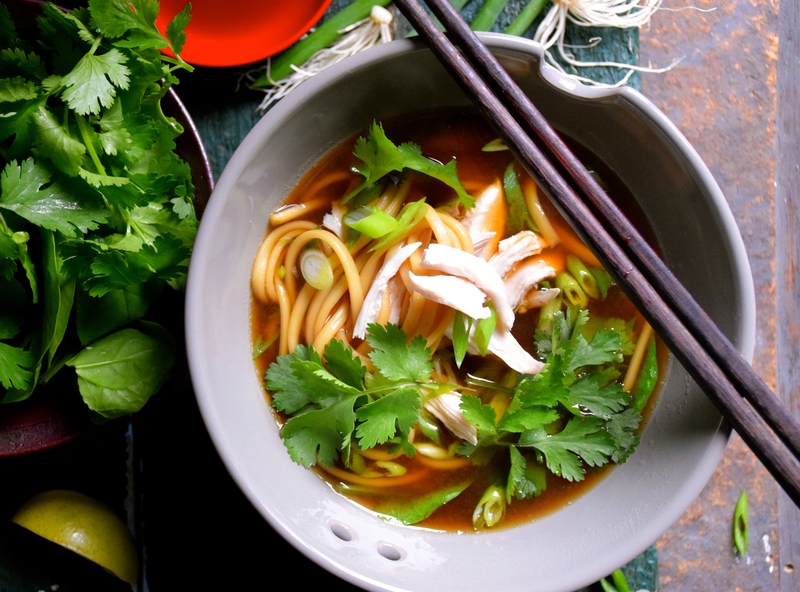 Wishing for a bowl of this udon noodle soup right now. What a beautiful recipe! Love the colourful pictures. Great post! What a refreshing recipe. This will definitely help me relax after a long hard day. Thanks for sharing. Loved this post. I agree that the best way to slow down is to get into the kitchen and so some serious good slow cooking.